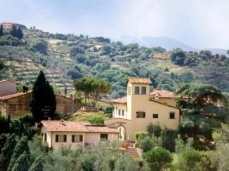 Villa Cipresso 2 is a fantastic Vacation rentals in Florence. 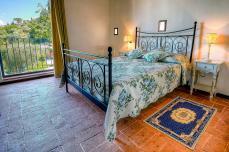 This Florence holiday accommodation satisfies those discerning guests who looks out for a perfect Italian Vacation. The villa sets on the foothills of the Bertini Hills and has a magnificeint view over the entire Arno Valley. The estate itself has a private forest best suited for walks, Olive groves, wine yards, Cyprus trees etc to fulfill your dreamy vacation. There is a cooking school inside the estate for guests interested in cooking. They can either enroll for the classes or just come for the lunch / dinner. The villa is very much family oriented. There are few other villas in the same estate and your children will find palymates / companions to play / tour with. Chefs and multi lingual tour guides are also arranged upon request. We also organize various customized tour programs bst suited for our guests. The villa inside a 100hc Pandolfini estate along with few other villas sleeps upto 40 guests and is also perfect venue for those who preferred to have a real Tuscan wedding. The villa enchants its guests in all forms. At a walkable distance from the estate you have all kinds of shops, Piazzaries, restaurants, banks, chemists, post offices etc. 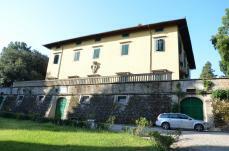 The estate is a perfect florence holiday home for those guests who rely on public transportation. There is a bus stop at a few hundred metres from the estate and the train station at 800 m from the estate. Trains from here run to all major areas like Florence, Rome Venice etc. The typical wooden beams, terracotta floors, original wooden doors and stone work depicts the architecture of the time. The farmhouse is fully equipped with dishwasher, oven, fridge/freezer, satellite tv and washroom with ironing facilities and washing machine. there is also the laundry for the guests. The large apartment consists of a country kitchen with its fireplace, there is a toilet and a second bathroom on the ground floor. Steps lead to the upper floor with three bedrooms, 2 doubles and a triple bedroom , a full bathroom and a living room . there is a lovely loggia for dining and relaxing outdoors there is also the laundry for the guests. There is wi-fi connection and the access is available from certain hotspots on the property. we cannot guarantee wireless access inside the villa as the walls are made of thick stone and sometimes you may need to move around to get access. note: fireplace is just ornamental at this villa. for security purpose they dont allow the use of fireplace in this villa. 40mins to montecatini; 45 mins to pisa & lucca. 40mins to siena/volterra/san gimignano/arezzo. the perfect vacation for the traveler who wishes to enjoy the country, explore tuscany and marvel in the many wonders of the breathtaking city of florence. The owners are proud tuscans who wish to offer their guests an insight to real tuscan living and surroundings. Iris Jun 20, 2013 18:06 We thoroughly enjoyed our visit in Tuscany - all 10 of us. We rented both Villa Cyprus I and Villa Cyprus II and found all accomodtions as advertised. The location is central for side trips to Pisa, Cinque Terre, Florence, wine tours, and more. For the majority of our travel we relied on public transportation, but you need to be able to walk quite a distance. We utilized the trains - never attempted the bus service, which is actually a much shorter walk. Sharmila was a veritable fountain of information and arranged for a van, a doctor to come to the villa, horseback riding, wine tastng tour, and other plans we required. We highly recommend having the chefs cook dinner at the villa - also definitely consider having the first night`s dinner prepared and delivered for your arrival (everything is closed). What a wonderful place for a Tuscany vacation!! !